We had another great week in St Ives at the end of July. 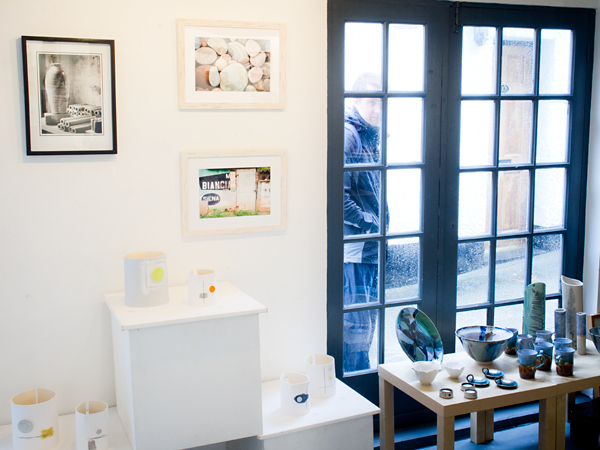 The gallery was busy with interesting visitors including a seagull. Chantal Fordham joined us this year for the first time. She handbuilds fine earthenware vessels decorated with ceramic buttons. Form an orderly queue please. This photos shows Chantal’s vessels, Chris’s photos and my thrown pottery. Chris successfully exhibited his photographs this year. Bernard Faricy joined us again and entertained the gallery with his guitar playing and singing. He drew a crowd busking on the harbourside, too. Highlights for us, apart from being in the gallery, were a visit to the spectacular Tremenheere Sculpture Garden and a night at the Minack Theatre. This entry was posted in Exhibitions and tagged Salthouse Gallery on September 16, 2015 by Carol.